I’m extremely blessed to have the opportunity to speak before the The American Association of University Women ( AAUW ) on April 2nd! Nationally, the AAUW has been empowering women as individuals and as a community since 1881. For more than 130 years, we have worked together as a national grassroots organization to improve the lives of millions of women and their families. They have asked me to speak about how the world is becoming more connected and that this broad industry term commonly called the “Internet of Things” will change not only how we as consumers live our lives, but how business, commerce and government will change. This is a topic that I thoroughly enjoy speaking about as we as a society are just beginning to explore the possibility of literally everything in our lives being connected to the Internet and communicating with each other. The Internet of Things (IoT) can be found in your home, your office, your car, your city–really it’s everywhere around you–but what is it? How is it being used and what’s in store for the future? 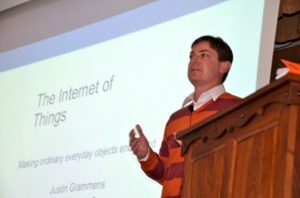 The IoT is the network of ordinary, everyday objects being embedded with electronics, software, sensors, and connectivity. This gives them intelligence that they never had before and will change our world. 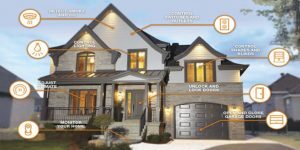 Products like smart cars, thermostats controlled from a smartphone, streetlight sensors, and medication dispensing devices are already creating efficiency, safety, and comfort. With more than 20 billion connected devices projected by 2020, the IoT is one of the fastest growing areas of technology today. This presentation will discuss where the IoT came from, where it is today, and where it is headed in the future. We will also look at some real world examples of where technology and connected products and devices are making a difference. I’m excited that through this talk that I’ll be able to share some of the many projects both at a conceptual and detail level that the team at Lab 651 has been able to deploy that help companies decrease costs, increase revenue, increase revenue streams or improve the quality of life. I want to thank the AAUW for the opportunity to share my experience in this growing industry of the Industrial Internet of Things. Over the keynotes and group presentations this past month, I feel that I’ve been able to tie it all together across Law, Business and Technology to tell as story in which companies absolutely need to be thinking about how they use technology and the connectivity of the Internet to transform their business to stay ahead of the competition. I’m dating myself, but I think back to how the world that my parents lived in the 1970’s and how it was so much different to how we live today. White Pages and pay phones were used to look up contacts and make phone calls. The business efficiency of today are orders of magnitudes higher than the past. There was no quick exchange of information, finding meeting locations involved paper maps and pay phones to call someone to get directions. The Internet has completely changed this communication bridge between humans. What the IoT promises to bring is a level of intelligence and communication with ordinary everyday objects around us to make our lives better. If you are thinking of going out into the world of connected products, call an expert! Lab 651’s Innovation Delivered process helps you identify your business goals, addresses them with innovative technologies, turns them into quick and cost effective POCs and if ROI is substantiated, turns goals into reality. We’ve done this for hundreds of clients.